Since the launch of model series T 20/T 25 SP in 2004, Linde Material Handling has sold over 33,000 such pallet trucks worldwide. This makes the manufacturer the clear market leader in the platform pallet truck segment in Europe and sets a benchmark in the field of intralogistics. Linde will be presenting a number of new, customer-oriented optional features for these successful models at its World of Material Handling (WoMH) 2016 customer event. Around the world, these platform pallet trucks with two or two-and-a-half tonne load capacity facilitate the loading and unloading of HGVs as well as pallet transfer and order picking. 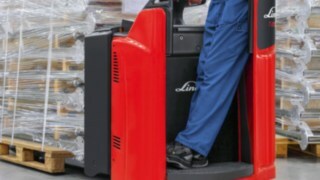 Linde’s unique driving concept is key to the resounding market success: The main load of the transported goods rests on the drive wheel so that braking and acceleration forces are accurately transmitted. In addition, a hydraulic damping system with tilt sensors for the lateral support wheels ensures maximum stability and driver comfort in all situations. Whether cornering, on uneven surfaces or on slopes – the operator has full control of the vehicle and the load at all times. The new equipment options enhance driver comfort, efficiency and reliability for Linde T 20/T 25 SP platform trucks even more. The main innovation is the completely decoupled and damped stand-on platform. Platform and steering system form a compact unit, which is decoupled from the chassis. This has led to about 30 percent reduction in jolts and vibrations – both mechanical and human. With this innovation, Linde takes another step towards the ergonomic unity of man and machine. This is because platform pallet trucks Linde T 20/T 25 SP feature proven e-Driver technology. This allows the driver to comfortably rest his back by leaning, while standing at a 45 degree angle to the direction of travel and steer the vehicle with one hand, with which he can also control all drive and lift functions. The 45-degree position provides optimum visibility of the route and load in an ergonomic body posture. In this way the driver can concentrate for a long time without getting tired and he is positioned in such a way that his health is not compromised. To facilitate working in poorly lit environments, Linde has added LED work lights to its range of optional features. These lights help to make processes safer and more efficient, for example when loading and unloading truck trailers with dark interiors. The light is positioned within the vehicle contour, protected against damage, and can be switched on and off with a single move of the hand. In addition to process safety and driver comfort, customers particularly appreciate the high uptime and power of the platform pallet trucks. Both are assured by the truck’s 3 kW AC traction motor. Its high torque ensures powerful start up. After less than five meters, the vehicle reaches its maximum speed of 12 km/h. The trucks and their new optional features will make their debut at Linde’s WoMH in Offenbach, Germany which will take place from 9-25 May. Visitors to this customer event will be offered the opportunity to test-drive the vehicles themselves.